« The 2018 Quail Motorcycle Gathering. Honoring The Ness Family. New Special Classes and More. New Master Cylinder Covers. Knurled And Inlay Designs. Published by Cyril Huze December 20th, 2017	in Accessories and Customs. 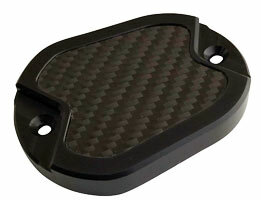 These master cylinder covers are a replacement for Sportster and Touring models. 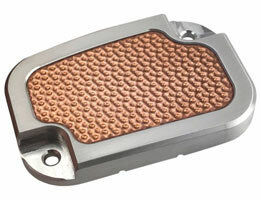 They are machined from aircraft grade 6061 T6 billet aluminum and are offered in 3 versions: Hammered Copper Inlay, Carbon Fiber Inly and Knurled. That are conceived to complement upcoming new parts from Brass Bass Cycles:, grips, fuel door, tank panel, etc. .
Fitting: Sportster: Sportster: 2004-2017 XL. Touring: Brake Fitment: ’13-’18 FLHT, FLHR, FLTR, FLHX, and ’13 H-D FL Trike. Clutch Fitment: ’17-’18 FLHT, FLHX, FLTRX, and ’14-’16 with use of ’17-’18 gasket & carrier. 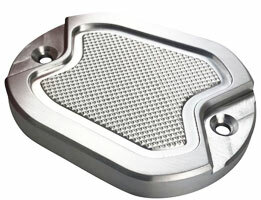 These parts are available through authorized dealers and Brass Balls Cycles. the copper won’t tarnish if you polish it enough.